Some users are complaining that the My Photo Stream option is missing or not available on their Apple devices. This article explains why it happens and how to get back that option in the right way. 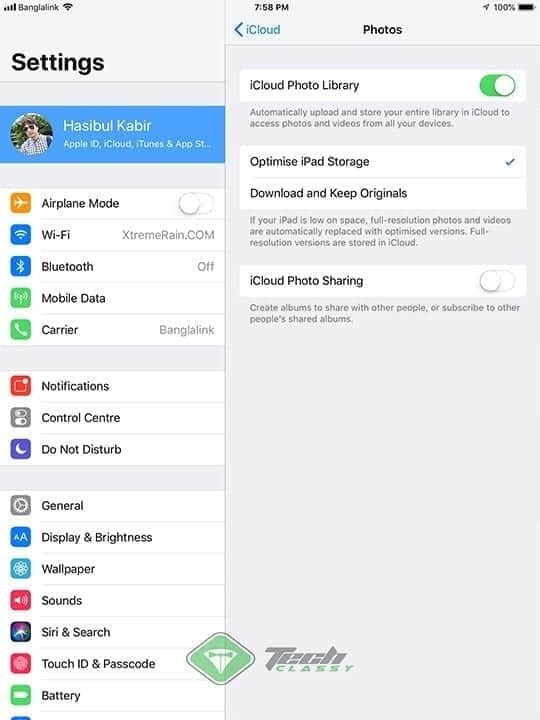 If you are either an iPhone or iPad or even iPod user, you may be familiar with “My Photo Stream.” It should be available if you have an apple device connected with an iCloud account. You can find it on Settings > (Your Apple ID) > iCloud > Photos. But, If this option is missing, probably, there is something wrong. It may have several reasons. But, It has some common solutions. If you recently created your Apple ID, My Photo Stream might not be available. Use iCloud Photo Library to keep your photos and videos in iCloud. So, If you are a new user, this feature may not be available for you temporarily. Still, You can follow these solutions to see if it brings the luck. If you got a supervised iPhone or iPad from your organization, the photo stream feature might not be available. Because Your organization may have disabled this feature. In this case, You can do the following things. First of all, You can go to Settings > General > Profiles & Device Management. Now, Remove the profile and restart your Apple device. If you can’t do the above procedure, You may have very little things to do. You can request the administrator to have the photostream feature. It’s weird but if you enable iCloud photo library, it may bring the photostream feature. I have no idea about it. But, I have seen this suggestion on various forums. To do it, follow these things. At first, Go to Settings. Then, Tap on your Apple ID (Profile). Now, Go to iCloud > Photos and tweak the switch next to the iCloud Photo Library to enable it. This is another weird solution. As this problem is mainly encountered by the new Apple users with new Apple ID, you can use a different and old Apple ID and see if it helps. According to some random sources, “If someone has a new Apple ID and login into an iOS 11.2 or later device, photo stream feature may not be available for him/her.” In this can, you can login into an old iPhone or iPad and you may get the My Photo Stream. Once you have got this feature, you can login into the new device. Hopefully, These suggestions will help you to fix my photo stream not available problem on iOS devices. If you have any other suggestions, you can let others know in the comment box.